Page Header and template selected has gone all white and made font invisible. Try adding this, it is a table that looks the same as yours and will not break your page. I've tested on one of my test sites and it works! I think I ought to leave it a couple of days now that Yola have said they'd look into it but if they have no joy I will certainly give your table a go. Changing the subject slightly, do you know if there are any books (in shops like The Works) that help you to learn, understand and teach you how to write your own HTML? As long as they're not too expensive, I think I'd like to buy one. I have some fantastic news for you! I believe I have now fixed up the HTML issue that was occurring as a result of the displaced Yola Footer. This Yola Link is back in its' rightful position. Now that has been addressed, we can begin focusing on the other issues. Do you mind summing up again what you are wanting to do with your table border? My needs are simple. I'd like a black border (black tabs in the Navigation bar that go white when the pointer rests on them, the usual sort of thing) with white pages and black text. And the hard part...HTML tables that don't cause issues. The links are straightforward as they just open pages in storage. As for the tables working with updated info from the HiPage "Sports League" software that is not important as I can update all tables by hand (as long as I don't cause any other problems LOL). I hope this is pretty straightforward as I don't want anything too flashy. Just thought I would add that the content area is the issue. It has broken, and is not showing anymore than 10px. Sanja is not currently online but I have forwarded this to her for when she returns. Thanks Martin - please leave this again with me. I'll see what I can do. Sorry about the repeat posts but I installed Internet Explorer 9 tonight and ever since Windows Reports have been popping up telling me programs have been experiencing problems and had to close down in order to restart. This happened when writing my reply to Sanja but fortunately I was expecting it and copied the message to her before it crashed. When the page re-opened the message wasn't there so I re=posted it a second time and the page crashed again. I posted it a third time and (yes, you've guessed it) it crashed again. This time I gave up and rebooted the laptop to find that all three messages had successfully been posted. I suggest using Firefox, Martin! If you wish to stick with IE9, try clicking on the compatibility button. You can also try updating your Flash and Java. ...I wanted to post a simple diagram of a typical webpage I am trying to achieve throughout but the "Add an image" software is taking far too long for a 30.4kb Jpg. Am I jinxed or what? P.S. : At least Windows has stabilised and nothing has crashed in ages. Since my initial problems with Internet Explorer, and all programs connected with Windows functions, things appear to have settled down. One error report linked it to a Winzip App that was in my Windows Sidebar. I clicked on it's X and co-incidentally or not everything's calmed down. Thanks for the Firefox advice (I have heard people recommend the same on a few occasions, LOL). Hope my website is progressing ok? I woke up this morning and came up with a theory that I'd like to run past you. When creating my table on the index (home) page, I wasn't sure which number stretched the full length of the longest cell. So I altered all the longest ones to 300 pix. Upon reflection, I highly suspect this would eventually encroach upon the page or surrounding widget boundaries causing the border colour changes. What do you think? I am forwarding your request to Sanja. She will reply as soon as she is back online. Thanks for your patience! On the page "Spring 2011 Results", can you please tell me why the two halves of the page have visibly merged, and how I can add a two mm (minimum) space between them? I can't understand it cos although I'd been tinkering with the page (prior to you asking me to leave it with you) to try and sort out the border issue, I reverted the page back to it's former state only to find this new problem. I only hope when I start to enter numbers into the cells of the tables that I don't have to stretch the cells to accommodate them. Currently, your navigation is black and the hover is white? So, I am not sure what you mean? I've attached a screenshot of what I see. Please do clarify! Your background is white and your text is also black so this seems to be in good working order? Your HTML Table code should be fixed up from the last time. Though you will need to click on the "Publish to the web" button to apply the changes to your live site. The index page has changed since yesterday and it is now exacly how I would like it with the black surround (or border), white page and black text. This is what I am trying to achieve throughout the site. The only pages that aren't like this now are the Spring 2011 Results (which also needs a 2mm gap between the two halves of the page, and the 20 XP Teamsheets. The latter may sound like a lot of work but if you can crack one, the others will alter in the same fashion. You know I really appreciate everything you, the other Reps and Andi North have done for me. If I can repay this by giving others some fun for free with my Fantasy Football League then the stress will have been worth it. The website looks really good since you've been sorting out my page problems. I've got some catching up to do - on and off the computer - but with your help it won't be long before I can make a start. I hope you are getting closer to finding the cure for my XP Teamsheet pages, which are suffering from the same problem - a lack of colour (black) in the page borders. As I've already said, I'm confident if you solve one page, the rest will follow really quickly as they were made exactly the same with just a change in the title on the page. I have now fixed up all your pages in the Sitebuilder. Please be sure to click on the "Publish to the web" button to apply the changes to your live site. If there is anything else I can do for you, please let me know. 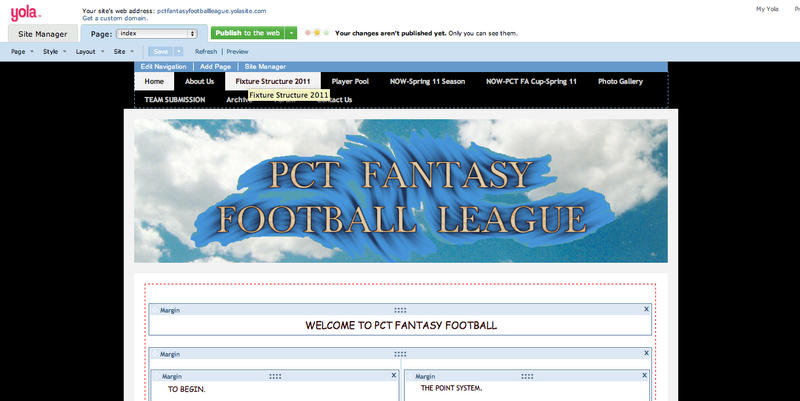 I clicked on Publish to Web as instructed but there are still 20 pages (sample: http://pctfantasyfootballleague.yolas...) that are still borderless. Please can you check this out for me just in case there is still a problem. I thought I had cleared my browsing history at the time when I checked those pages. However, it appeared I needed to do it again (amazing how quick your cache builds up). Thanks for reminding me Andi, and thank you Sanja for everything you've done. Andy...I will keep this page in my favourites bar as I might need to refer back to your table programming. I feel a little sad as I've enjoyed our chats (even they were only about HTML lol). Hope our paths will cross again sometime. Hey Martin! We are glad to hear that everything has been sorted. Thanks for your kind email - we look forward to being in touch with you down the road should you need assistance. Cheers! No problem, always here to help! If you get stuck on anything else, just ask it on the forum and I am sure someone can answer it! On the page "Spring 2011 Results", can you please help me by putting a one or two mm (minimum) space between the two halves? The table was originally written by a program as a single table but I split the page and HTML into two halves - placing a half in each but they seem to have merged together. I have fixed this up for you. What i have done was drag over another Column Divider Widget and then dragged one of your tables into the right hand column of the Column Divider Widget. Then, I dragged the middle green bar over to create the space needed. You will need to click on the "Publish to the web" button to apply the changes. Nice to speak to you again. Great! Thanks very much. I had a chat with my nephew who co-runs the new website and he came up with a good suggestion. How about a visitor widget that counts the number of visits you get and puts that info into a graph so you can see if the website is popular. If not, the website owner(s) like ourselves can decide whether to re-vamp it or, at it's extreme, drop the project altogether. What do you think? Can you forward our idea please? Sanja is currently on leave, but I am sure your "Thank You" will be very appreciated. I have some good news for you, we do have a site traffic feature where you can see the amount of traffic your site is getting on a graph! Here is a link to another thread with more detailed information on this: Site traffic statistics are now available. I hope you find this helpful! I recommend Google Analytics. It gives the best statistics out there and is free. You can find out what browsers people are using, where people are viewing your site from in the world. If you would like basic stats, Yola does have it's own system. Look at Site Visitors in your My Yola. Google Analytics is easy to set up and works a treat! Nice to speak to you again. Is this a dumb question? Where do I find Google Analytics...on here or on a Google website? ...I've taken a look at their official website (after Googling lol) and wasn't sure which one was best for us (or how to use it). What about Bravenet? I seem to remember they had pretty good touches (like a visitor counter) when I considered making a website a few years ago. If you wanted to see the finer details of the visits, then you signed into your Bravenet account and all you wanted to know was there in your counter's profile. If I had found Yola back then, I would've used Bravenet to add extra touches. But it's been a few years since then and technology changes so maybe Google Analytics is better? What you have to do is set up a new account with Google Analytics. Follow the instructions to set up a new website with Analytics, you will recieve a code, click on the HTML button, then copy this code and paste into everypage of your Yola website. Google have comprehensive help instructions (Click on help). I would recommend following these. If you have Yola Silver, there is an option to add the code to all pages of your website. Sorry Andi but I'm only a freebie (not Silver) does this make it harder? Just means that you have to add a HTML widget to everypage with the code in. It is not too difficult. Which one do you recommend, Andi? If you would like a very simple and easy to use system which has 7 days worth of tracking (free users) then use the Yola system. If you would like tracking for the life of your website, data about where your users accessed your site from in the world, which browser they used, which operating system, how long they stayed on each page for, how long they stayed on your site for, and much more... use Google Analytics. I personally use Google but that is so I can get the most accurate statistics. It really is upto you... use which one you want. Google Analytics would require you to add HTML to every page on your site where as the Yola system is already there for you. But, the Yola system only keeps data for 7 days whereas Google keeps the data forever. Good luck with whatever system you think best matches your demands. Mmmm. I think I'll discuss it with my nephew again and let him see what Google Analytics is like before finalising our decision. Until then, I've picked a simple one from Bravenet to be going on with. Thanks again for the advice, Andi. Sorry about this but for some reason I can't explain, my photo gallery page has now got a black page. I can't understand it cos my HTML boxes are small in content and, as far as I can work out, I can't see an obvious reference to colours in the programming. Sorry for being a nuisance but could you take a look at it for me and if it's an error I can learn from, could you tell me how not to make the same mistake again. Hi Martin, the page has broken again! I have looked and I can not find the solution! Hope this helps until someone from Yola's HTML team can comment with a solution. It will be one of your HTML elements which has broken the page... which one is the question!